A general ring is defined (sizes 4,5,6,7,8) and the ring and metal-C bonds are all specified as of type "any" (it is difficult to know how such bonds might be classified, ie delocalised, aromatic, etc, so best not to constrain things) and a metal is attached. 4M is basically any metal; again the search is unconstrained, but one could focus on certain columns of the periodic table if one wished. 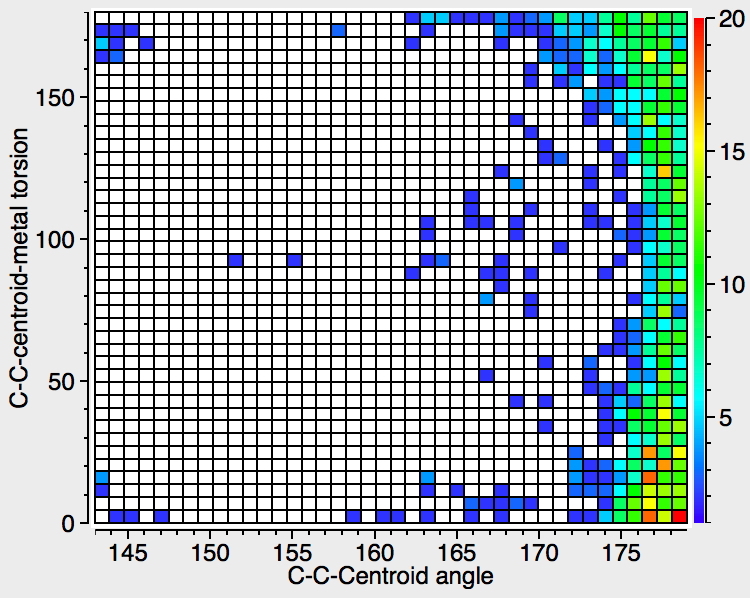 A ring centroid is computed. 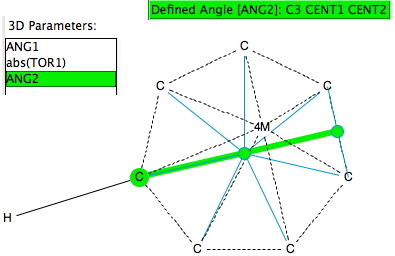 ANG1 is defined as the angle H-C-centroid, the angle of interest in Andy's talk. The limits were constrained to lie between 140° and 179°. I did this because when the angle becomes 180°, the torsion becomes mathematically undefined and I did not want to risk this happening. 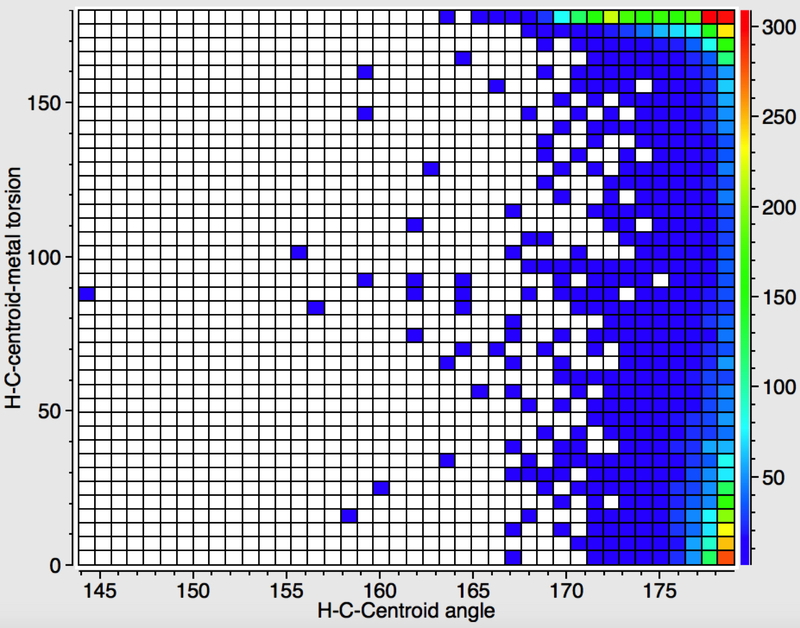 TOR1 is defined as the torsion H-C-centroid-metal. Values of 180° would indicate that the hydrogen was pointing away from the metal; values of 0° would indicate it was pointing towards the metal. The absolute value of the torsion is taken to avoid confusion induced by its sign. ANG2 is one test whether the ring is planar. For an even membered ring, it is the angle subtended at the centroid to opposing carbon atoms. For odd membered rings it is the angle at the centroid involving one carbon and a centroid defined by an opposing pair of atoms (see below). The quality of the crystal structure determination is controlled by specifying that the R value be < 5%, no errors, no disorder. 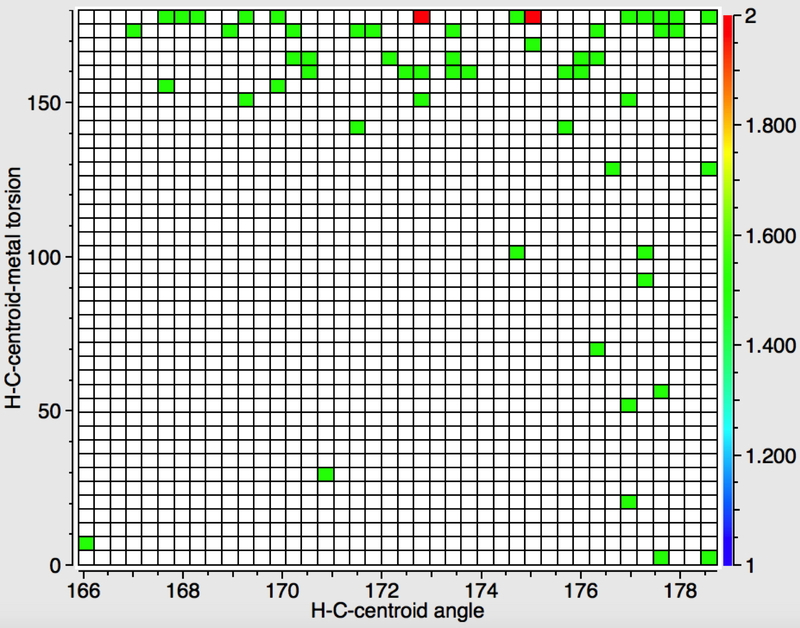 Also, the terminal H-positions are normalised (to correct known errors in H distances deriving from x-ray diffraction). I would point out that in the early days, the actual positions of the hydrogen were often not actually determined, but "idealised". 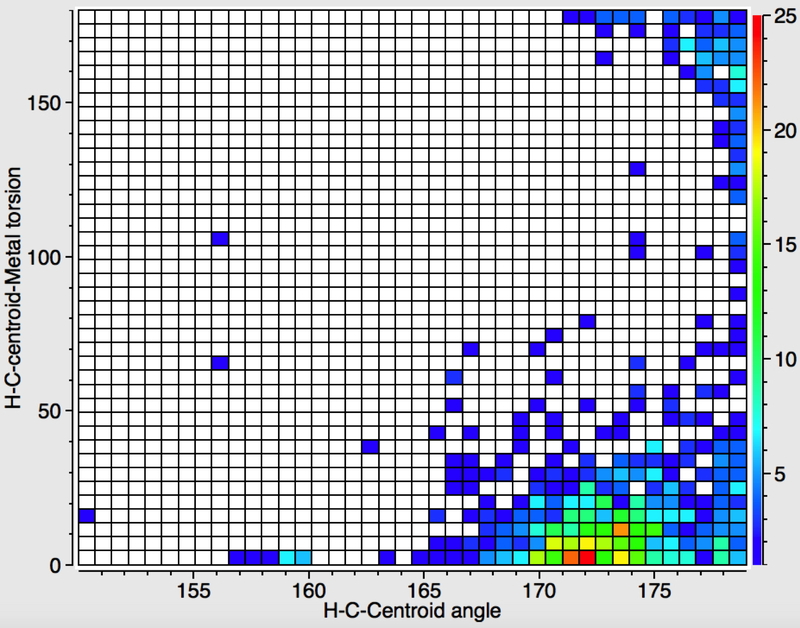 In this case this would mean that the H-C-centroid angle would probably be set to 180°. For perhaps the last 20 years or so however, the positions of hydrogen atoms have been routinely refined. Unfortunately, I know of no search query that can separate the two cases, and so we will have to live with the mixture and see what we get. We define another constraint separately, which is that the temperature of the data collection sample is <140K. This ensures that the data will be free of more vibrational/thermal noise and so should be rather more accurate. Finally, a note on the topic of "research data management" or RDM. I have deposited the files defining the search query in a repository and have assigned DOIs both to the overall search collection and to each individual search definition, the DOIs for which are shown below. The 4-ring case. Here the temperature constraint was relaxed, since there are few entries. The two red "hot-spots" occur at torsion angles of ~180° (hydrogen pointing away from metal) at bond angle values of between 173-176°. The 5-ring case. This includes the classic ferrocene example, the first metallocene for which the structure was correctly identified. There are many more examples, and this search is now constrained to <140K. The two hot spots occur at bond angles of very close to 180°, at which values the torsion itself becomes undetermined. That the hot spots actually occur at 0° and 180° and are not spread evenly across the right hand side axis is remarkable given this. 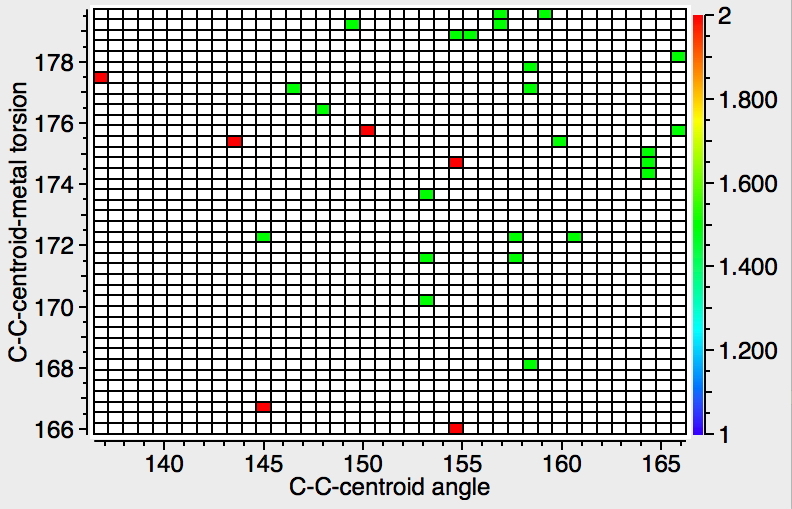 There is a significant tail for the 180° torsion (H pointing away from metal) down to H-C-centroid angles of about 170°, but there is no evidence of this tail for torsions of 0°. One more test must be applied to see if the 5-ring is planar or not. 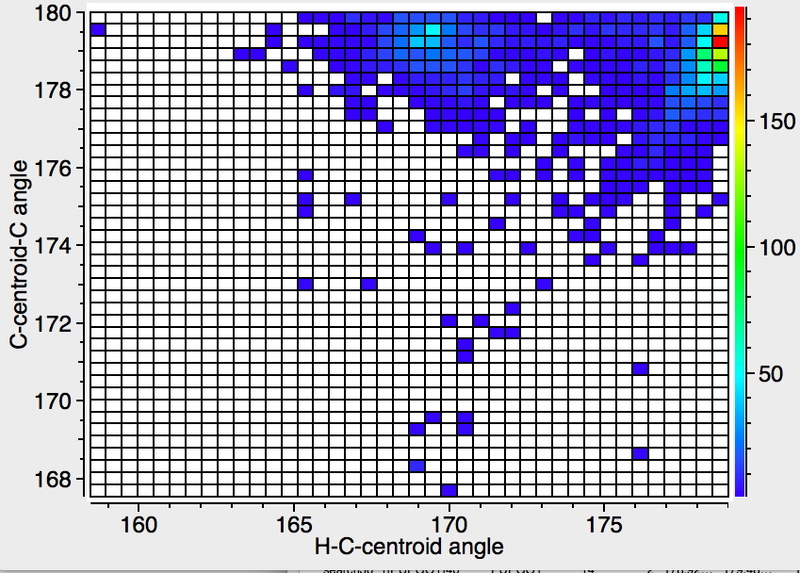 The deviation from planarity is only 2-3°, and there seems to be no correlation between lower values of the H-C-centroid bond angle and non-planarity. The 6-ring case. There are again numerous examples of data <140K for such rings. There is now a very distinct hotspot at angles of ~170° for the case/torsion where the hydrogen is pointing towards the metal. 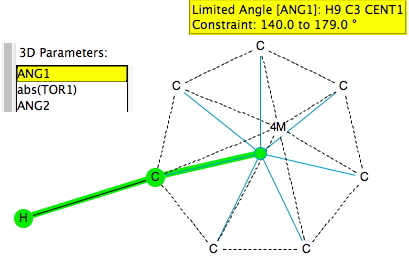 This feature persists when the ring planarity is tested, and it occurs specifically for rings where the angle subtended at the centroid is ~180° and H-C-centroid angles of ~170°. So this is clear-cut effect which demands explanation #1. The 7-ring case again shows a strong hot spot at ~172° for a torsion corresponding to the hydrogens pointing towards the metal. 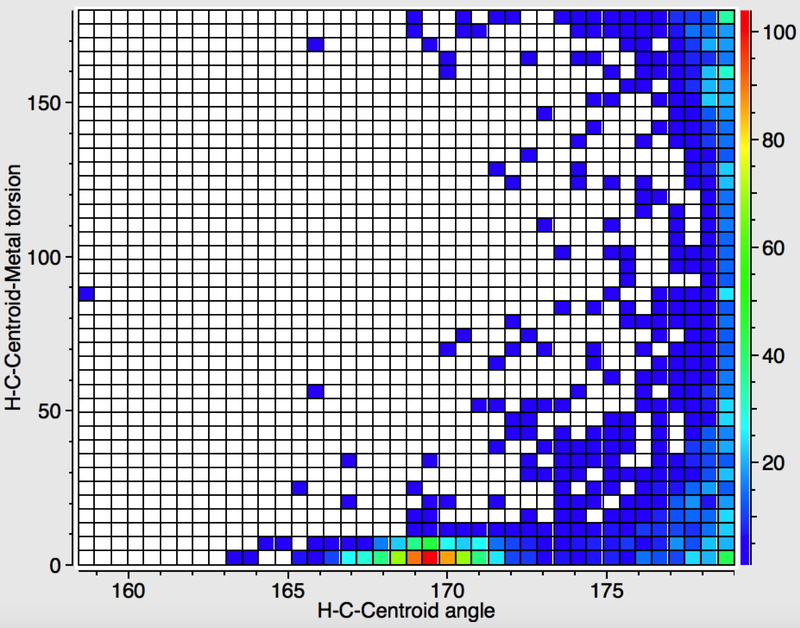 This hot spot is matched by angles subtended at the ring centroid that are close to 180° (i.e. planar). This is clear-cut effect which demands explanation #2. 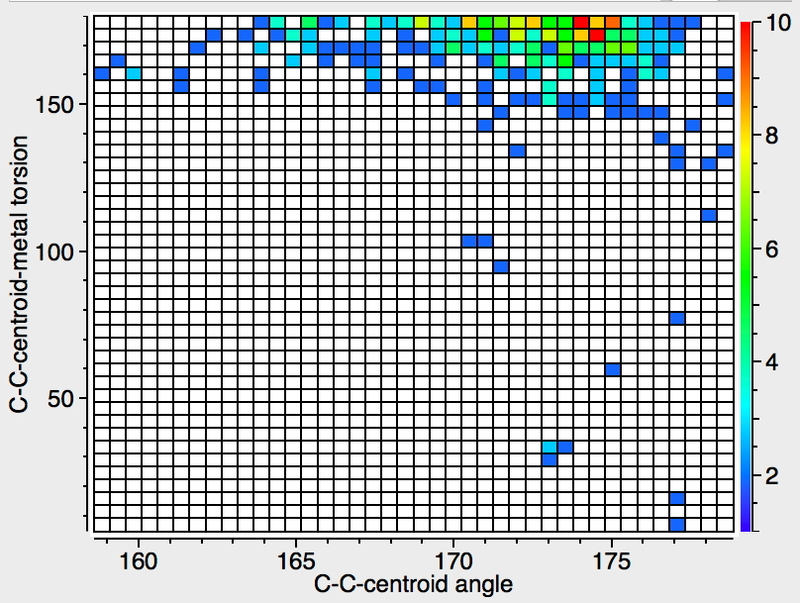 The 8-ring case also shows a hot spot for hydrogens pointing towards the metal by the strikingly large degree of ~157°, and this feature is associated with a linear C-centroid-C angle. This is clear-cut effect which demands explanation #3. The 9- and 10-ring cases. There are no examples! Time to make some? An immediate question that arose from this discussion was whether the hot-spots were artefacts of non-planar rings. So the ANG2 test was added to the plots the next day (today) as part of this dissemination. Also discussed (yesterday) was how these conference insights might be shared. I suggested the forum here and Professor Streitwieser heartily agreed. Another alternative was to write it up as a regular journal article. But we both agreed that ..
what you see here is just a statistical analysis. The next stage would be to individually inspect all the molecules which make up these statistics. You see it might just be that every molecule contributing to a "hot-spot" cluster might have special circumstances which conspire to make it look as if there is an interesting chemical effect going on. It is unlikely that such coincidences could accrue in such a manner, but the possibility does have to be considered. 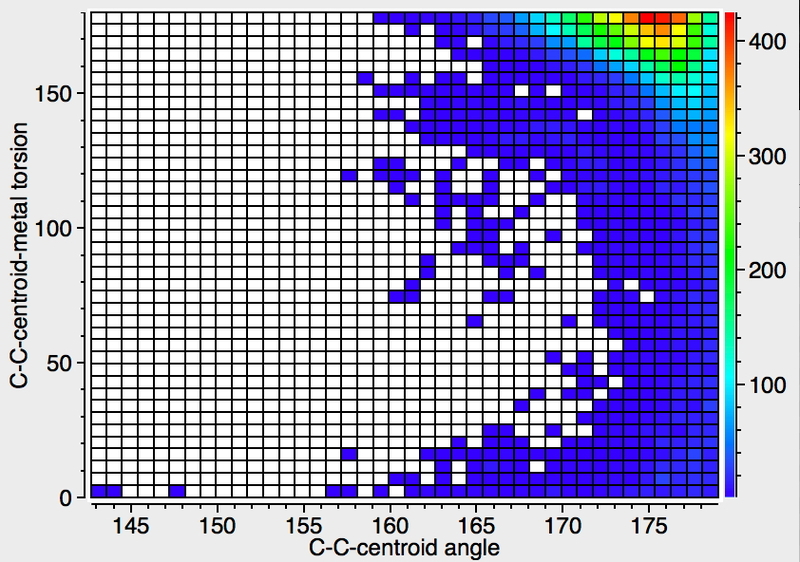 I think we both felt that a better way was to expose the basic effects here, as a sort of open science research project, and anyone interested could then (a) try to replicate these plots, which is why you will find the DOIs of datasets containing the definition files to assist in any such replication and (b) tunnel down to any specific hot spot to identify the precise chemical characteristics that might give rise to the geometrical effect. This could then be followed up by computational analysis of the electronic properties which might give rise to the effect. This would in effect complete the cycle, since this was the starting point for Streitwieser's original talk. Remember, the theme of the celebration was the interplay between theory and experiment, a particular favourite of Schleyer's. Regarding the chemical insights, a distinct trend over the ring sizes 4-8 can be seen. The 4-ring shows the hydrogens pointing away from the metal, the 5-ring could be said to be largely agnostic (remember the error in crystallographic angles is probably in the region 1-3°) whilst there is an indication that for the 6-8 rings the ring hydrogens tend to point towards the metal. I have summarised three key points illustrating this as #1-3 above. It is tempting to conclude that a fairly general chemical effect is operating here over #1-3, although of course it could be a number of effects specific to each ring which merely look like a general trend. So the chemical interpretation of this project is unfinished, a general feature of much of science of course. But my aim here was to give a flavour of how a scientific meeting at its best can bring together like (or often unlike) minds which can tease out new connections and lead perchance to new discoveries. ‡These hours were productively employed by sharing a Franconian banquet together, and a modicum of sleep, as well as the searches described above. And in case you see no citations at the bottom of this post, they too take about 48 hours to propagate through the CrossRef and DataCite systems. Be patient and they will appear. †In my original representation, I showed the Hs pointing towards the metal. In fact Prof Streitwieser has just contacted me reversing this orientation and correcting my recollection of his lecture. This entry was posted on Saturday, April 2nd, 2016 at 2:21 pm and is filed under Chemical IT, crystal_structure_mining, Interesting chemistry. You can follow any responses to this entry through the RSS 2.0 feed. You can leave a response, or trackback from your own site. One reads: "… why the calculated structure showed that the hydrogen atoms attached to the cyclopentadienyl ring pointed slightly towards the metal rather than away from it (by ~1-2°). Various explanations had been put forward, some had waxed and then waned. It was still basically an open problem." So, in the end what is the explanation? In my opinion the word "explanation" does not mean to compute or to measure something precisely, but to bulid a simple model that makes it possible to uncover "basic" parameters that are responsible for the observed effect from a mess of irrelevnt factors. Without such a model I don't think we have an explanation. In the post I did not describe the explanations as presented in the lecture, which were not simply a numerically computed model but indeed attempts at a deeper insight. Prof. Streitwieser went on to show in his lecture how one such model was tested and ultimately found not to be convincing. I have deliberately not touched upon any possible "explanations" in the current post for either the specific case of a 5-ring or the more general one of the trend across the ring sizes, although anyone is free to suggest one. 3-ring. Unlike the H-search, there are a small number of examples of this the smallest sized ring. In all cases, the C is pointing away from the metal by a large degree. 4-ring. 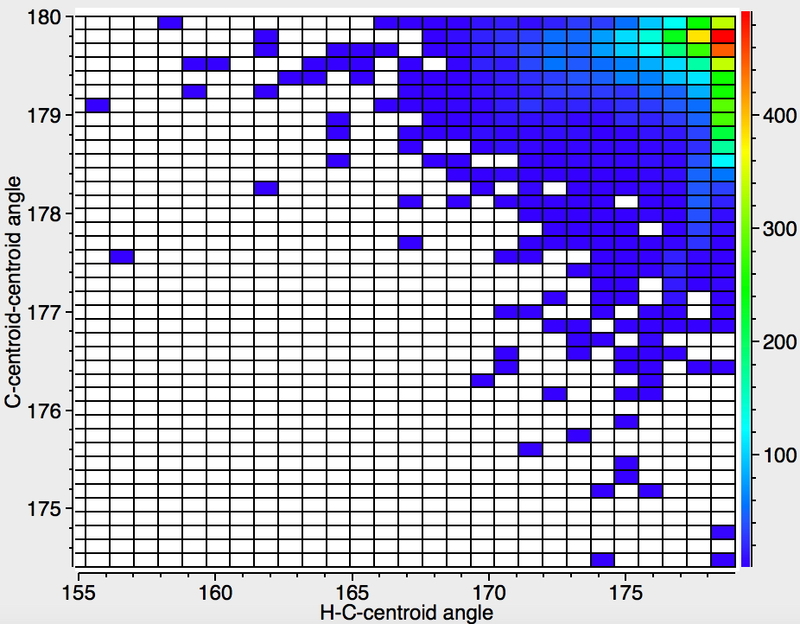 This plot contains many more examples than for H. A very clear cut effect with the ring substituent C pointing away from the metal, the hot spot being ~175°. 6-ring. A change now, with the hot-spot corresponding to the C pointing towards the metal, but only by a small degree, ie 177-178°. 7-ring. Not many examples, but all have the C pointing towards the metal, but by a larger degree than the 6-ring (167-176°). 8-ring. 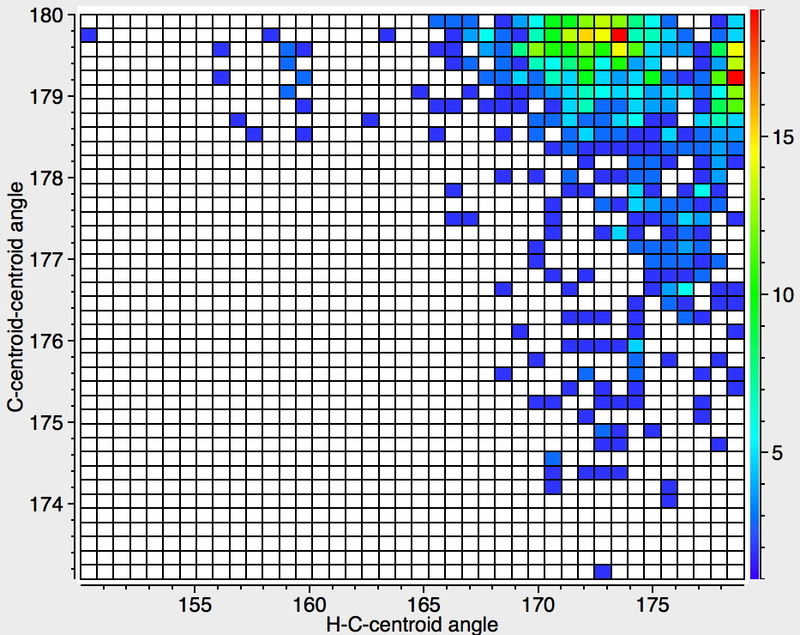 A clear cluster pointing towards the ring, with angles of 170-175° and a second cluster with torsions of ~90 that probably represents a different class of compound. 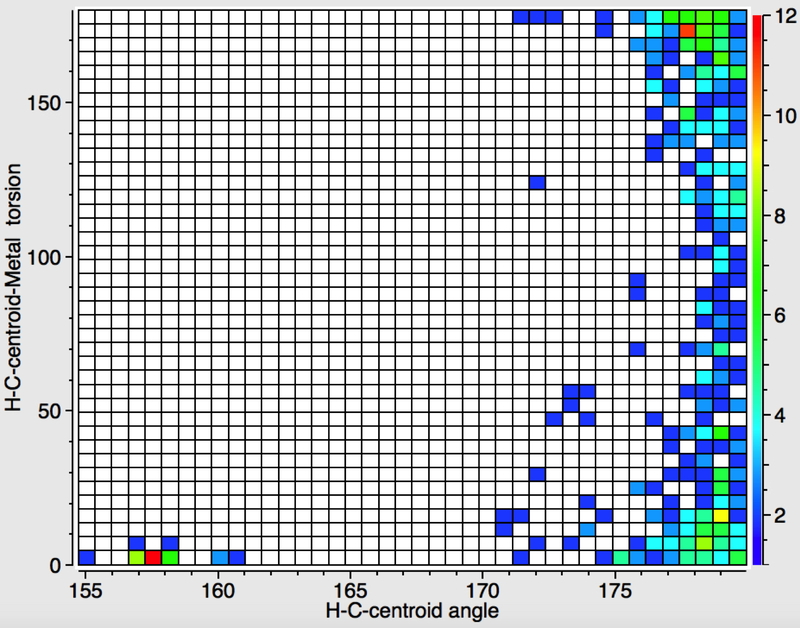 The overall trend is that the small rings have H or C substituents pointing away from coordinated metal, with a cross-over to pointing towards the metal at larger ring sizes of 6-8. The structure of CpTiCh (cyclopentadienyl-titanium-cycloheptatrienyl) encapsulates some of the above results (see doi: 10.5517/CC10R5XV for a closely related derivative). 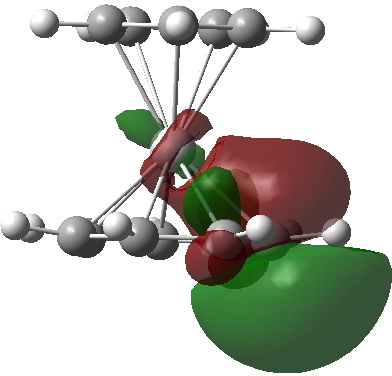 NBO (natural bond orbital) localisation of the wavefunction (doi: 10.14469/ch/191991) reveals two different types of C…Ti based orbital. 1. 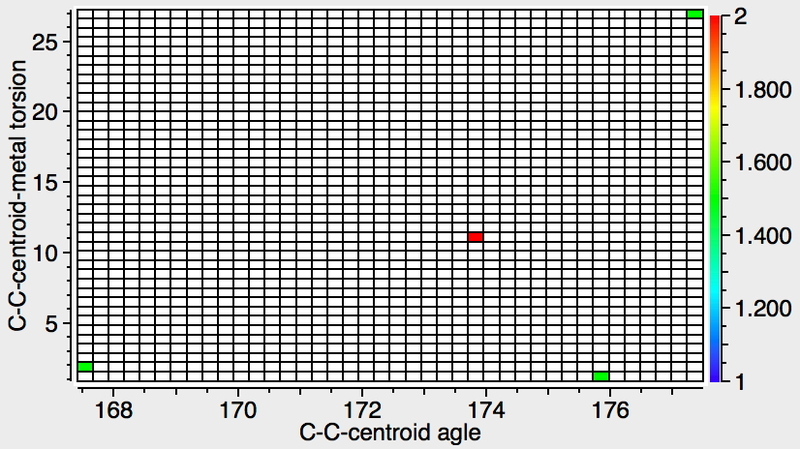 The C…Ti bonds in the 7-ring are shown below. They can be thought of as a p-orbital centered on any one single carbon being bent over to overlap with the Ti orbitals. This tilting induces the ring C-H to lean towards the metal. 2. The C-Ti bonds in the 5-ring are different. Now a π-bond between a pair of ring carbon atoms interacts with the Ti orbitals, in a manner that requires very much less tilting. This does not explain why the H-C ends up pointing away from the metal, but at least we now have a difference in behaviour between the two different sized rings. 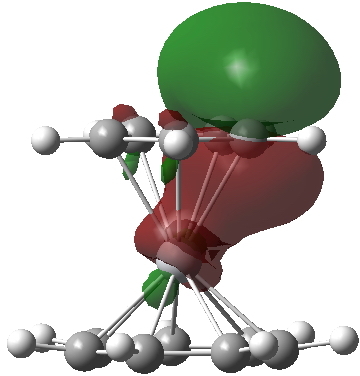 The previous example, CpTiCh comes out as a 16-electron example of a transition metal. Moving two columns forward to CpCrCh gives an 18-electron system. The calculated wavefunction for this variation is at doi: 10.14469/ch/191993 and it shows similar localised orbitals to the above, 2-centre and 3-centre orbitals, with the latter predominating on the smaller ring. I have tracked down the following article: doi: 10.1023/A:1009597723152 which reports crystal structures for five mixed metallocenes with ligands of two different ring sizes. 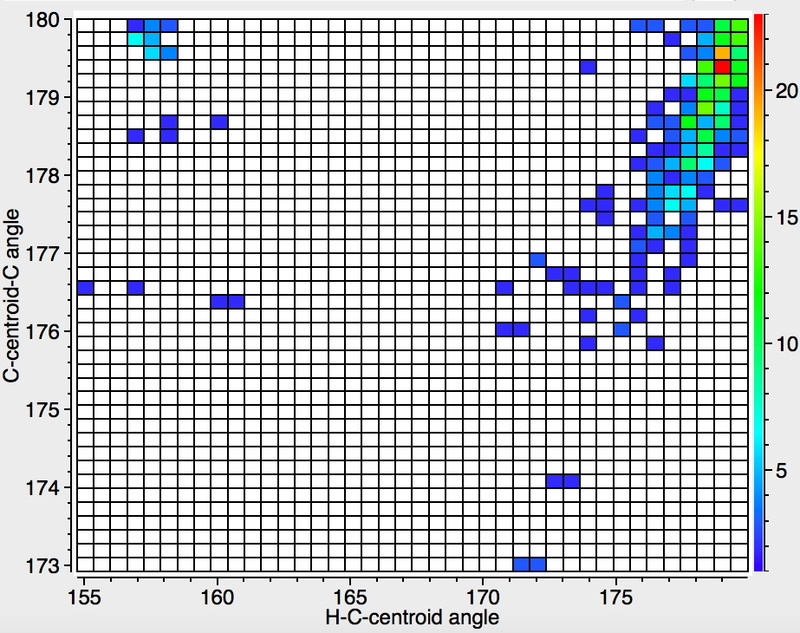 If you go to Figure 3 in this article, here they suggest that for ligand rings <5 the hydrogens on the ring tilt away from the metal, whereas >6 they tilt towards. This matches the plots above pretty nicely. 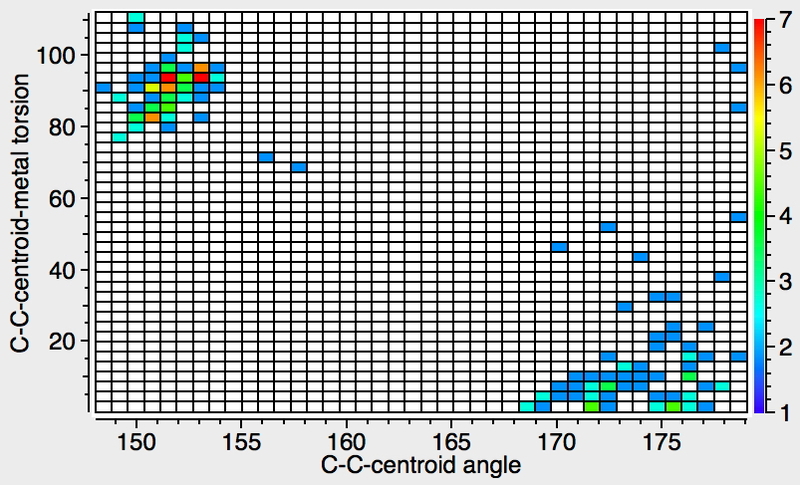 This diagram also suggests that it is the overlap between the p-orbital on the ligand carbon and the metal d-orbitals that determines this tilt (much as is seen in the NBOs above). This also suggests that the LiCp complex that started this theme rolling, and where there are no d-orbitals on the metal, is something of an exception.